A 1958 sweetgum tree on Hawthorne Street was the latest to fall. Permits are required in some, not all, cases. If the name of Forest Grove conveys anything, it's the strong relationship between the city and trees. Big and particularly old trees are landmarks of sorts in Forest Grove. Pacific University, at the heart of town, is so famous for its tranquil, wooded campus that it has been used — this month, even — as a filming location for television shows. For decades, the city development code has required that new developments, whether along a public or private street, plant at least one street tree if they have 100 feet or more of frontage. As with most cities, Forest Grove was built up piece by piece. Many houses were built all at once — and many street trees were planted all at once. They have grown up as contemporaries, and now, some of them are coming down as contemporaries as well. On Tuesday, Dec. 11, workers from Eduardo's Tree Service made short work of a giant sweetgum tree in the front yard of a home in the 1300 block of Hawthorne Street. The tree was planted in 1958, and homeowner Robin Lindsley said it had begun to wreak havoc on the house. Tree crews "have taken down many trees in our neighborhood recently due to roots growing into crawlspaces under houses here," Lindsley told the News-Times. In some cases, those wayward root systems have infiltrated water lines and septic systems, Lindsley added. 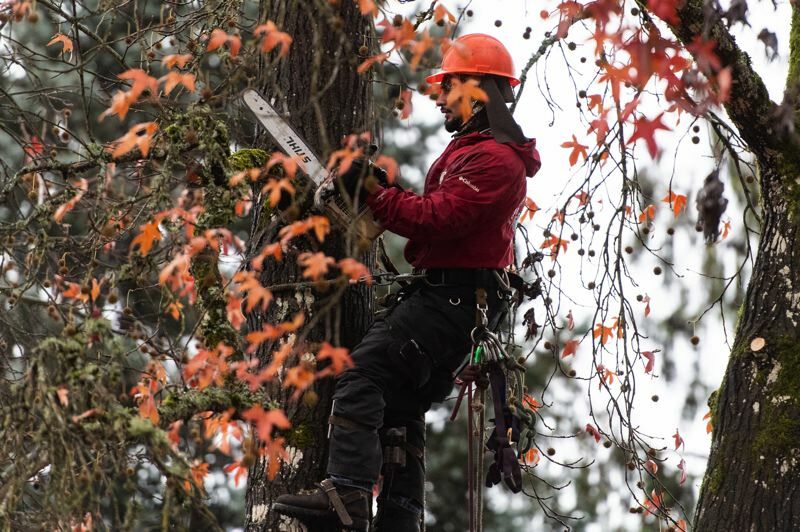 James Reitz, a Forest Grove city planner whose duties include signing off on all tree removal permits the city issues, said he believes he has approved a record number of permits for the city this year. "Most years, we issue around 45 to 50 permits, and this year, we're up to 58 with two weeks left," Reitz said, adding, "There might be one or two yet to come." The city requires a permit for any tree removed that either falls within the public right-of-way — in common parlance, a street tree — or is located on a development site. Therefore, Reitz's permit totals don't include trees removed solely on private property, such as in a backyard. It's hard to be exactly sure why so many permits have been requested and granted this year. But Forest Grove was largely built up during the mid-century, as its population exploded from fewer than 400 people in 1930 to more than 8,000 in 1970. (Growth has continued at a somewhat slower pace, with the city now estimated to be home to more than 24,000 people.) Lindsley's sweetgum and many of her neighbors' street trees would have been planted during that period of expansion. "Part of it's age," Reitz said. "Everything dies." Another possible factor: Large-scale development has picked up over the past year or two in Forest Grove, with the city opening its first three new apartment complexes of the decade, as well as its largest new commercial center in years, during 2018. Any trees taken out to accommodate that construction would have needed permits as well. In more recent years, the city has changed its approach to street trees. "Historically, street tree planting was left to home builders," an urban forest management plan produced by the city in 2016 states in part. "Many trees, however, did not fare well due to improper tree selection and planting in less-than-desirable locations. To address this problem, the City now selects trees with input from homeowners and manages tree planting to ensure proper placement." Improperly planted trees can cause major damage to both public and private property, given enough time. Root systems of particularly big trees — such as sweetgums — can fan out over an entire city block or more, and if the roots are shallow enough and expand sideways, Reitz said, they can cause cracking and lifting of sidewalks and road surfaces. "The sweetgum seems to be an example of the wrong tree in the wrong place," Reitz said of the tree removed last Tuesday. Huge though it was, Lindsley's sweetgum was not even close to being the biggest street tree taken down in Forest Grove this year. A sequoia removed from the front yard of a home in the 2400 block of 18th Avenue, across from Rogers Park, was so massive that work crews ended up removing it in phases, taking off the branches in February before removing the trunk in sections in March. The wood from that tree will be repurposed for use at Rogers Park, which is slated for major renovations next year.